HenSafe Automatic Chicken Coop Opener for Chicken Security. Our customers say it's the best. Robust, Rugged, Reliable. HenSafe Automatic Chicken Coop Opener: The Industry and Farmer's Choice for your Backyard Hens. Our customers tell us it's the best on the market - check out our reviews. Easy to install and operate via the electronic display panel. Made with quality parts, robust, rugged and reliable - everything self-contained in one unit, including the internal timer and light sensor - no extras to buy. Excellent customer service, full backup and support with a 2 year electronics guarantee and servicing options. Designed and made in Wiltshire, United Kingdom. See how it works and contact us if you need more information - we're always happy to help. HenSafe is your one-stop solution for chicken security and peace of mind, giving you time for other jobs. Easter Holidays will be with us soon! 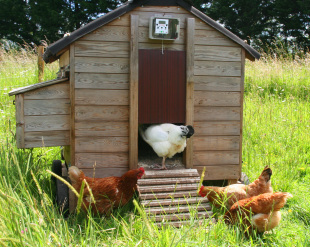 HenSafe is the perfect solution for hens while you are away. Peace of mind for chicken keeper and flock. Set your door to operate at a specific Time, Light level or, with our unique feature set it to Both which uses time and light together. Plus a Manual Button for complete flexibility. Mix and match your settings and change them whenever you want to suit your situation. Remote Light Sensor on a 1m cable also available and fitted so you can mount HenSafe inside your walk-in shed chicken shed or barn. "I would like to compliment you on an excellent product. I purchased my first HenSafe from you last week, installed it, set the time, calibrated closing light and set an opening time within 20 minutes. It works a treat." 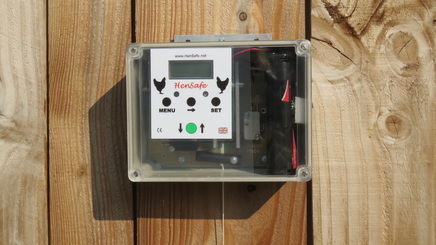 "HenSafe is an excellent, user-friendly British-made product that does exactly what I want: it lets the birds out when I want, and it shuts them up again when I want. It has taken a load of worry from my mind and I have no hesitation in recommending it to other poultry keepers." "I selected HenSafe because of the variety of setup possibilities. Thanks to a comprehensive description and the reason behind the implementation of the features, I got a very good impression of the company behind the product. This made all the difference in my choice of supplier. The product has NOT disappointed :-)"
"Best purchase I have made in a long time, I love it and the Ducks and Chicks do too"
"The HenSafe has revolutionised our life and means we can go away for a night without worrying. Excellent service when I rang with an enquiry"
"Arrived within 48 hours of ordering. Many thanks!"